Lifespan: 6 to 12 months. Several months without feeding. Bed bugs (Cimex lectularius) were a common nuisance back in the 1950s – common enough to inspire the familiar saying “goodnight, sleep tight, don’t let the bed bugs bite.” After years of successful pest control, their numbers dropped, but in recent years bed bugs have returned with a vengeance, and are resistant to many of the same pesticides. Bed bugs have a tendency to infest furniture, clothing, the linings of baseboards, and anywhere they can hide safely. Their bites cause an allergic reaction similar to other biting insects that itches (although not everyone has symptoms). Fortunately for humans, bed bug bites do not spread disease, though scratching bed bug bites puts you at risk for infection. Eggs – A fertilized female bed bug lays between 1 and 5 eggs per day, and up to about 500 eggs over the course of her life. The eggs are visible to the naked eye and are small, cylindrical and whitish in color, usually laid in cracks and on irregular surfaces. Juveniles – A bed bug spends 5 of the 6 stages of its life in a juvenile, non-reproductive form. As a juvenile, the bed bug will shed its skin 5 times before maturing into its final form. 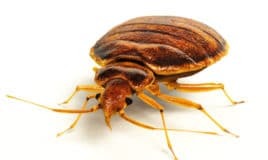 Mature Bugs – When mature, the bed bug is a light or reddish brown, flat, oval-shaped bug with a segmented or subtly “striped” abdomen, roughly 4-5 millimeters in length. Lifespan – In optimal conditions, a bed bug can live for about 9 months. Without feeding, bed bugs are able to survive for up to a year in colder climates. In the warmer climates that bed bugs prefer, however, mature bed bugs can still survive without food for up to 5 months, while juveniles can survive for several weeks. Bed bugs prefer warmer climates and areas well-populated with mammals – especially humans. They are attracted to mammals primarily by the carbon dioxide we exhale and by the warmth generated by our bodies. These bugs are mainly active at night, but are not exclusively nocturnal. They are found indoors and usually on furniture such as chairs and beds, where they will also lay their eggs. While they are associated with beds, they may congregate anywhere with “food.” Bed bugs may be found in offices, movie theaters, and restaurants, though most will hitchhike to someone’s home where it’s safer. Bed bugs have built up immunity over the years to various chemical solutions used for their extermination, but qualified bed bug control experts can still find solutions to ensure your bed bug problem is resolved. Currently there are no effective strategies to kill bed bugs without professional treatment. However, if you believe you have come into contact with bed bugs, place all of your clothes and items in a plastic bag and heat them for 30 minutes in the dryer (provided the items can go in the heater). Bed bugs are sensitive to extreme temperatures.